Home > Review	> Portal 2: Now STOP Thinking with Portals! 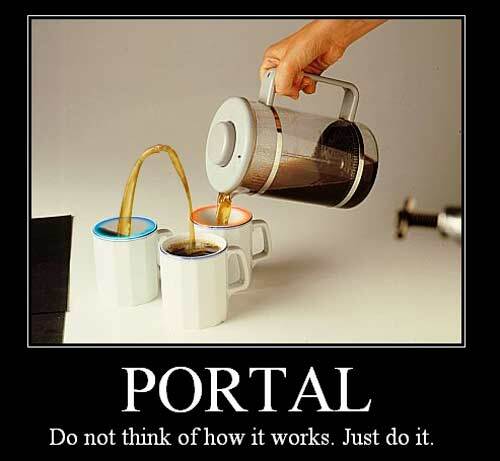 Portal 2: Now STOP Thinking with Portals! Now I realise that this review is coming about three months late. Well you know what, you can just deal with it! Having left days before the release of Portal 2 I wasn’t around to review it when it was released in April this year. Since I got back however I put aside some time in the past few weeks to complete it and I managed to finish the game and hear the ending song just yesterday! Hooray! Now I have been a massive fan of Portal since I first played it in the Orange Box (The Orange Box, by the way, is only £12.99 in http://www.amazon.co.uk and remains an absolutely fantastic deal as you get Half-Life 2, Episode 1, Episode 2, Portal AND Team Fortress 2 all in one compressed disc of pure joy) and as such when I heard about the announcement of Portal 2 I was understandably excited. Aaaaanyway! I was worried that Valve might mess it up, that the magic of the first one might not be contained in the second or (be still my beating heart) it might simply be boring and samey. To my great relief though it was absolutely fantastic! The graphics and environments looked great and definitely held onto the old Portal feeling of creepiness and of ancient rotting ruins. The gameplay was only improved from the first one with the Portals working as they always have (speedy thing goes in, speedy thing comes out) and better yet they even added new things to mess about with, including gel which speeds you up, or makes you bounce and boxes which can deflect lazers. And the new things don’t feel like they are there simply for the sake of newness, the feel great and fit perfectly with the challenges they are placed in. As well as the gameplay being top-notch and the graphics being great, the story remains as cool as the first one. It isn’t a complicated story but it is actually a reasonably good one and all the secret easter egg stuff about what’s going on in the real world (for those of you who don’t know, Portal is set in the Half-Life universe) gives a great sense of depth. Also the voice acting by Ellen McClain (GLaDOS) and Stephen Merchant (Wheatley) is absolutely fantastic, and there is more than one moment of great amusement in something one or the other of the characters says. In fact that has always been one of the great things about Portal: how funny the AI characters can be in it. So there you have it. A truly fantastic game experience, where thinking with Portals remains a top-notch single-player experience! But wait… That’s not all folks! Portal 2 includes a two-player multiplayer campaign and let me tell you, it is just as amusing and good fun as the single-player. It doesn’t have a story itself per-se, but then who cares about story. GLaDOS remains amusing throughout the campaign and the challenges remain, well, challenging. In fact I will say some of the multiplayer challenges were even more difficult to solve than those in the singleplayer (as you would expect when you have four sets of portal rather than two). But again it never felt impossible. it felt difficult at times, sure, but those were the times when if you managed the challenge, the rewards were so much greater. So to sum up. A fantastic, top-notch single-player campaign where thinking with portal remains an absolute joy for the whole experience. And then a two player co-op campaign which simply piles more joy onto the first pile of joy to create an absolute mountain of pure portal-joyness! The only thing that was lacking from the game is that I never got my cake. The cake, it seems, will remain a lie for a long time yet. Basically, if you are even considering buying this game… Don’t hesitate! BUY IT! I did have one complaint about Portal 2. It seemed that quite a few of the challenges could only be completed by one method set out by the developers. For example you might find a different route but its made so that you only miss the jump by a millimeter. I found that quite annoying since i felt in the first game you had more freedom to find “A” solution rather than “THE” solution. I do agree actually there does feel like there is a little less freedom with the solutions in Portal 2. Another tiny niggle I actually had was (along the same lines as your complaint) that Portal placement now has a sort of “stick-to-grid” effect. For example if there is one white block which you can place a Portal on, no matter where you shoot the block the Portal will appear dead centre. And I do agree this slightly less freedom that you have seems to be against the very idea of Portal. Otherwise see the rest of my review for how I feel. P.s. If you do play multiplayer you can expect to spend at least ONE level trying to kill each other by dropping each other in slime!